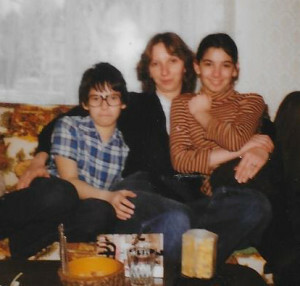 Andrew (on the left) with his sisters Shelagh (centre) and Alison. What does it mean in the political climate of 2016 that Andrew Balfour is my brother? Andrew is a First Nations man of Cree descent. I, along with the rest of our family, am white, of Scottish descent. That is not insignificant, as Andrew’s work Take the Indian so poignantly highlights. I know that openly acknowledging our relationship, and how deeply I love my brother, may cause pain to some who were harmed by the unjust and cruel policies of our country, anger to others. It was those policies that brought him to us, after all. But Andrew is my brother; no qualifications, no going back. And I would not have it any other way. Yes, in 1967, at least according to the adoption agency, Aboriginal children were labelled “unadoptable”. Bizarre, really, when looked back at from this point in the life of our country. Whatever the specific circumstances of my brother’s birth and adoption, the “Sixties Scoop” was in full swing. Aboriginal children were being adopted out by the thousands into white families all over North America. I knew of two other families in our neighbourhood alone where one of the children came from a First Nations background. But these children weren’t the lily-white newborns that parents unable to conceive dreamed of. They were somehow second best. Not to us, however. Our parents felt they were doing something important in bringing Andrew into the family; something important, but not something noble or sacrificial. Andrew was simply Andrew, the newest child in the family, our baby brother. Which is not to say they denied his heritage. From the first, it was important that Andrew know where he came from, who his people were. Of course, in those days, with adoption records closed, they could have only a general understanding of Andrew’s background. I know it pleased them when, as an adult, Andrew was able to learn more and his Cree identity became part of his life and his music. I wonder now if the adoption agency promoted the children they put forward in a way that would appeal to prospective parents. It isn’t just that “unadoptable” label which would appeal to the altruistic. Our parents were courted as the ideal parents for this child whose birth parents were university students and musicians. We would give him the background he needed to develop his gifts. (I recall even some mention of Scottish blood in the ancestry as well.) Of course, it was apparent almost from the first that Andrew was, indeed, musically gifted, and our family was a good place to foster those gifts, so perhaps I’m being unnecessarily cynical. I want to understand as best as I can, given the limitations of my location. I know I come from the position of privilege. It is not possible for me to grasp in any deep sense what it means to live the systemic racism of our country. It is not possible for me to gain more than a limited, speculative sense of what it means to lose your culture, your children. But, even though I can view it only dimly, I do know it is a deep and a profoundly important thing. And yet, Andrew is my brother – no qualifications, no going back – and I cannot carry that with shame or guilt. He is my brother and I cannot honestly say that I would have it any other way. This entry was posted in Uncategorized by cam_admin. Bookmark the permalink.